With the modern man attached to his smartphone at the thumb, today’s consumers often look to social media as the go-to route for customer service interactions with brands around the world. Additionally, there’s a greater incentive for brands to satisfy needs and fix problems expressed on social. An irate traveler in an airport only influences other irate travelers. An irate, inconvenienced traveler on social media influences their followers – and potentially many more. These words imply all sorts of misery: long lines, angry travelers, overbooked alternate flights, missed connections and hours on the phone with airline customer service. Except not anymore. On a recent trip, my wife and I experienced the dreaded cancellation, and all 150 to 200 people from our flight were told to go to the main customer service desk for rebooking. Anxiously waiting in line, I started tweeting at the airline. There was no Twitter version of a phone tree, no time being put on hold. Within minutes, a person (indicated by a signature like this at the end of their tweets: “^LC”) got back to me. The representative requested I follow their account so we could discuss flight information via Direct Message instead of by publicly tweeting. 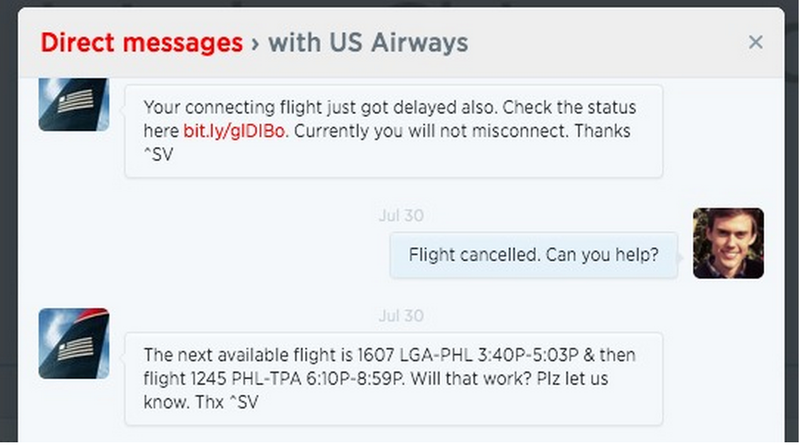 Less than 10 minutes after the initial cancellation, I had our rebooking – all via Twitter. We were still 20 to 30 minutes from the front of the line at customer service, and most of the people in front of me were on the phone – on-hold – with the airline. The best part? We were rebooked on a plane departing within 15 minutes. If we’d waited on traditional customer service options, the flight would have been long-gone. Traditional service options would have left me a frustrated, stranded traveler. I would have hours to tweet snarky comments about the airline. Instead, it had a satisfied customer – already on Twitter, ready to share my experience. J.D. Power and Associates’s recent Social Media Benchmark study found that 67 percent of consumers have used a company’s social media page for service, compared to only 33 percent for social marketing. Those findings are huge. Brands already know to invest in marketing on social media. But the general consumer is coming to them wanting more. They’re asking questions, expecting responses. Social Customer Relationship Management is not just about outbound marketing. Social media is becoming the place for individualized, timely and shareable customer service. So, how can brands capitalize on this influx of consumers? Conversely, how can consumers get the solutions they want from brands? When brands separate their customer service account from their main profile, it keeps support inquiries separate from marketing efforts. It also allows for trained social customer services representatives to handle service requests, allowing social marketers to focus on building the brand in other ways. Aside from saving time and saving face, this segmentation also makes brands’ analytical data more meaningful. Standard KPIs mean different things, depending on whether the focus is marketing or service. In social marketing, KPIs typically focus on how a brand’s audience is responding to its content. 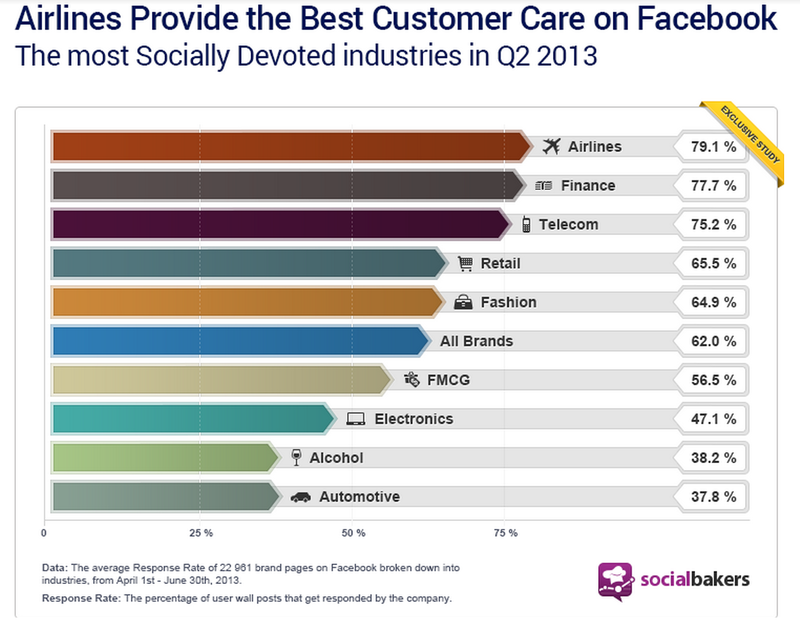 Conversely, the brand’s responses are most important in social customer service. In social customer service, engagement statistics such as response rate and response time directly measure the effectiveness of support efforts. 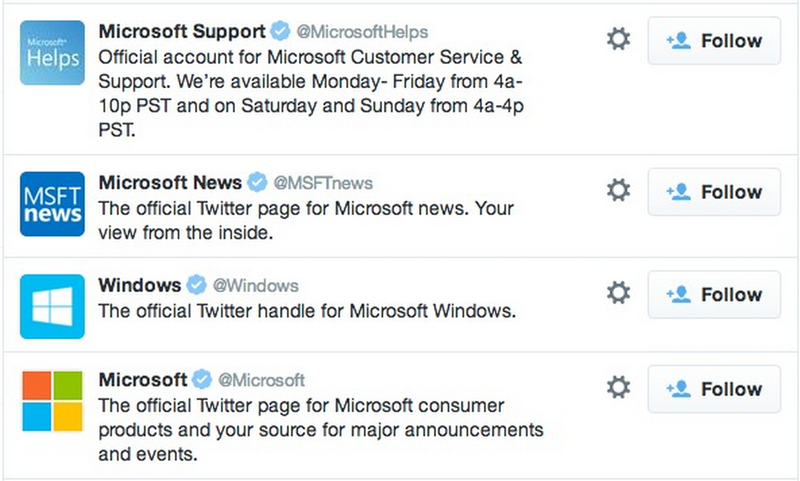 Microsoft does this well, segmenting different accounts to productively direct customer inquiries. The account representatives quickly respond to direct questions, and are also known for seeking out problems with products referenced indirectly on Twitter. The team’s response rate has room for improvement, but response time is exceptional. 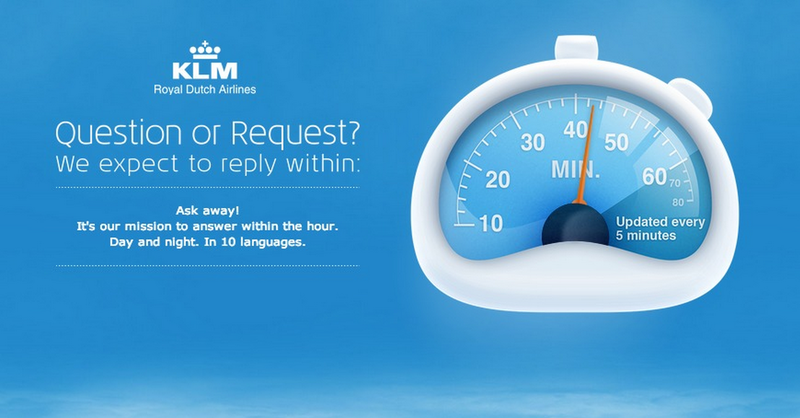 One of the industry leaders in response rate on social, Dutch airline KLM boasts 24/7 social customer support. For companies like airlines that sell time and convenience, this kind of service makes sense. Depending on company size and customer base, however, constant monitoring is probably not necessary. Most companies don’t staff their accounts around the clock, but they do clearly communicate when they’re available – and when they’re not. Whatever timing strategy a company adopts, this communication is key. The worst response to an upset customer? Silence. The AskAmex account team makes clear, direct and cheerful communication its focus. 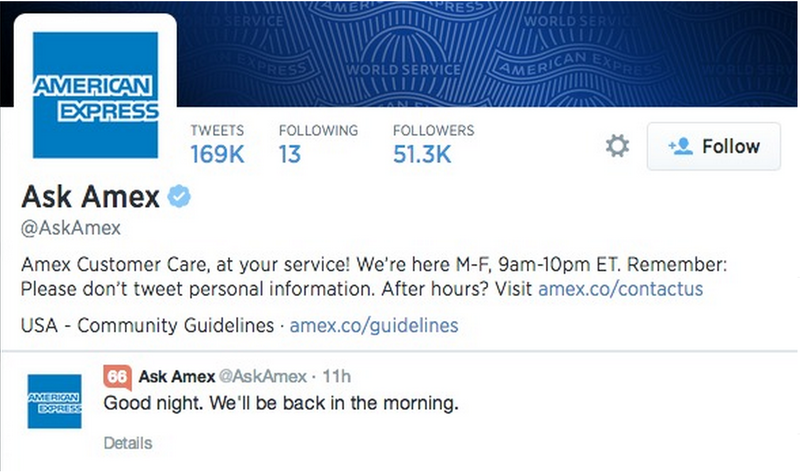 Considering the sensitive nature of the personal financial information they’re dealing with, AskAmex connects customers with its “community guidelines” for helpful privacy-related reminders. Publishing availability and community expectations helps prevent confusion and frustration, improving the customer service experience. Representatives, introduce yourselves. Even a simple, unique signature such as “^LC” gives customers indication of personal care. UPS similarly pushes for more personal connections on its Facebook page, including pictures of the representatives customers can contact. This helps to make the interaction efficient and effective, but also conversational. Practically, it also allows for multiple customer service representatives to monitor one account simultaneously. Each representative can claim inquiries and own those conversations, cutting down on confusion and response time. Yes, that response rate is correct. Zappos prides itself on answering every customer inquiry, and it has a team on-duty 24/7 to make this happen. 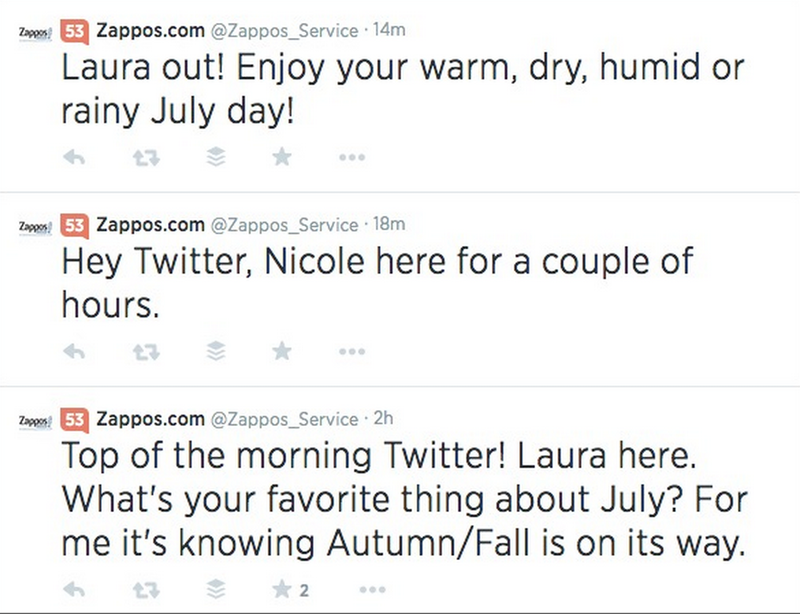 Zappos’ service representatives also set the standard for being personable on social media. They cheerfully sign-on and off and routinely offer light-hearted comments outside of specific service conversations. They also just seem to enjoy doing their job. This positive attitude helps put customers with concerns or complaints at ease, making the experience better for all. If you find yourself lonely online, reach out to @Zappos_Service. At least with them, a response is guaranteed. 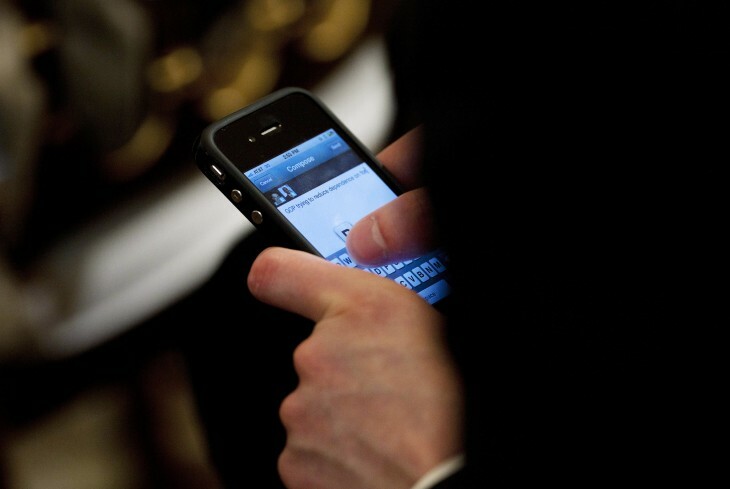 Social media allow brands to tackle service problems in an innovative new way. Brands can now seek out customers’ problems and answer questions before they’re even asked. This is called proactive customer service, and brands have been doing it for years. However, social media allows brands to do more than just anticipate customer issues. Now, brands can ‘listen’ on social for indirect product mentions (without the ‘@’ sign) and address issues directly. A sentiment tool such as Trackur to track mentions of brands and products and parses the results, analyzing positive and negative mentions. Brands can proactively address negative sentiment, turning public complaints into shareable solutions. Customers that share their frustrations then find out that a brand really cares about what they say and think. Want to get even more aggressive? Brands can take efforts to find and fix problems to the next level. Social listening and sentiment analysis lets a brand identify their competitors’ issues. Answering these issues proactively offers a dynamic opportunity to seize market share. UPS takes social listening seriously, and the brand has a reputation for proactively identifying and addressing customers’ issues. Turning a potential complaint into a definite satisfied customer is always a good decision. The account does, however, frequently miss out on the opportunity to turn inquiries into followers. It typically refers people to customer service email addresses for more detailed conversations. While understandable (especially in matters concerning sensitive customer information), this shifts the conversation away from the platform chosen by the customer. Using Twitter DMs or Facebook Messages would keep the customer engaged on social and minimize the hassle of switching platforms mid-stream. Anything worth doing is worth doing well, the adage says. Customer service on social is no different. Studies have shown that the same 32 brands from the Interbrand 100 had dedicated Twitter customer service handles, from 2014 compared to 2013. However, those same brands have increased their response rate in that time period by 43 percent. Those who have already invested in customer service on social media are upping their investment. If a brand wants to begin proactively supporting customers, make sure there’s serious commitment – in terms of mindsets and actual resources. Doing social customer service halfway – having sluggish response times and leaving lots of inquiries unanswered – makes customers feel more frustrated and less valued than if there’s no social support presence at all. There’s a reason you’ve already read about KLM in this post: the brand has social customer service figured out. Before many brands were taking the potential of social customer service seriously, KLM identified this as an inflection point. It even began explicitly marketing this expertise. It’s not a stretch to say that KLM’s investment in social customer service is driving the airline industry to grow in this competency as a whole. KLM leads the industry which, in turn, is pushing the development of social customer service for all brands. For personable, responsive and effective customer service, don’t pick up the phone (unless its to find a brand’s account on social media). Customer service on social media offers consumers unparalleled agency, interaction and convenience. For brands, it means cost savings and more satisfied, vocal customers. If you’re frustrated with your typical experience in a customer service phone tree, go online to get the answers you want.